This is one of those books that they are forever assigning to pimply-faced teens to read while in their early years of secondary school. Unfortunately, many of these books are just too deep, too adult, too mature (in the way they require age and experience to understand them) for kids to ken at all. I was first assigned this book as summer reading when I was 14 years old. There’s just no way that a 14 year old is going to have the life experience and maturity to understand what lies in between the lines of Thornton’s outstanding book. And, of course, I didn’t at that time. I skimmed and read the Clif’s Notes to pass the quiz and answer a few trivial questions during the one hour spent on this book once the school year started. It’s a shame that books like this are wasted on children. They should be required reading for adults once they reach the age of 30, though. 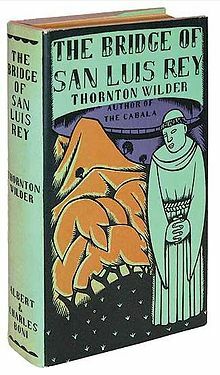 Posted by V. T. Eric Layton on 17 June 2015 in Books and Literature and tagged book review, Classics, fiction, literature, Thornton Wilder. Yes, I really enjoyed Bridge…. I’m a firm believer that you have to be ready for a book to fully appreciate what you find on the pages and in between the lines. There have been books that I could not stand the first time I read them decades ago. When I’ve re-read them through the lens of 30 years or so, what I got out of them was much, much more than initially. I haven’t really thought about that book in 50 years. Maybe I’ll give it another try, Eric–I barely remember it. Seems to me I just picked it up as a teenager–I don’t think it was for school but can’t be sure at this point!